The diamond-impregnated cleaning and polishing pads from meiko (DIPs) give floors a new shine. With the help of microscopic diamonds, these pads clean and polish surfaces with a level of care that produces a high-gloss finish. Forget about using chemicals – all they need is water. Matt, worn-down surfaces will finally become so shiny and clean again that their refreshed appearance is sure to win you over. meiko DIPs often manage to polish surfaces to a point where they look like new. The diamond-impregnated cleaning and polishing pads are very environmentally friendly because they are largely composed of natural fibre and recycled synthetic fibre. Water is the only ingredient they require to clean floors. meiko DIPs are excellent for everyday maintenance cleaning and for reconditioning surfaces, such as marble, natural stone, wood and concrete floors, ceramic tiles, linoleum, and vinyl. As such, the pads perform two tasks in one cleaning cycle – and no additional high-gloss care is required. The pads are very easy to use in that they don’t require any instructions and can be applied to all conventional floor cleaners. There are no additional costs involved. Thanks to the low level of cleaning and maintenance involved and the complete elimination of chemicals, you save both time and money. 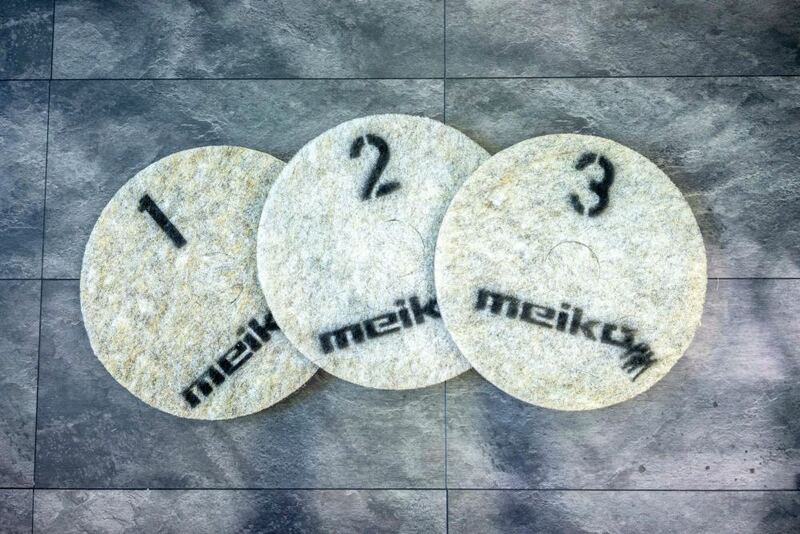 meiko DIPs are available in three versions.